Recently, I’ve been working with a lot of my students on PWA’s (progressive web apps), and also on cross-platform mobile apps built with the Ionic Framework. One of the things my students quickly discover is that for any app that allows any sort of information to be shared between different users of the app (or between different devices for the same user) their data needs to live in the cloud. In practice, this means that they need to build a REST API on the server where their data will live. FYI, I use Sublime Text as my code editor, but really, any editor should work. Also the full source code for the REST API I’m about to show you is available on GitHub. Feel free to check it out, fork it, or whatever you’d like with it. When users log into the app, 1) their username and password get sent to Auth0, which verifies their identity and 2) sends back a JWT. From then on, whenever the app needs to get data from the API server, rather than send the username/password, it 3) sends the JWT. 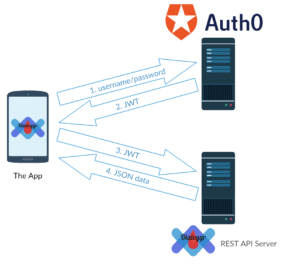 The REST API server is able to use the JWT along with the client ID and client secret for the Auth0 service to authenticate and authorize the app. The API server can then 4) send data back to the app. "type": "carbs", // or "sleep" or "bgl"
"value": 30, // number of "carbs"
"end": "", // used only for "sleep"
The first step in this process is signing up for an Auth0 account, and then incorporating their authentication code into your app. They have fantastic documentation on how to do this in one of their Quickstart tutorials. These tutorials are updated frequently to keep pace with new releases in their software. For Angular, choose “Single Page App > Angular 2” and for Ionic, choose “Mobile/Native App > Ionic 2“. 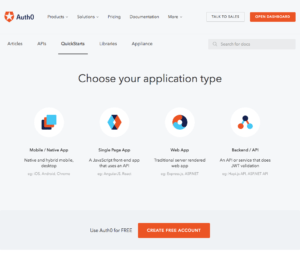 Once you have followed their tutorial, you should be able to start up your Angular/Ionic app, run it locally with ng serve or ionic serve, and then authenticate to your app using Auth0. Once this has happened, you will have a JWT stored locally in your app that you can use to connect to your REST API. For local development, I chose to set up a virtual machine running Ubuntu 16.04 which mirrors the exact same setup that I will have on my production server. In order to do this, follow this tutorial that I wrote for getting a Loopback development box running with Vagrant and VirtualBox. NOTE: you can safely skip Step 6 of that tutorial, since we’re not going to be using Loopback this time (although I plan to do a future tutorial which demonstrates this same process using Loopback and Swagger). Once you’ve created your virtual machine, go ahead and vagrant ssh into it, and cd api into your API folder. It is not necessary to adjust the firewall since we’ll only be accessing MongoDB locally from our REST API server. We’re going to save our server code on GitHub, so from the terminal, inside your virtual machine, initialize the /api directory as a new git repo by typing git init at the command line. Create a README.md file by typing touch README.md and create a .gitignore file by typing touch .gitignore on the command line. Open up these two files in your text editor. Type up a useful description of your app in the README file, and copy and paste the contents of this .gitignore file into yours, and save them both. You’ll also want to install a process manager to help you keep your server alive while running it. In my test repo, I’ve used nodemon, but on my production server I’ll be using pm2. Either one is fine. If installing nodemon, I would only install it as a dev dependency, i.e. npm i -D nodemon. $ git commit -m "created REST API server skeleton"
We’ll come back to add the code into server.js in a bit. First, lets create our model. I developed this model from the sample JSON object that I sketched out earlier in Step 1, and used the Mongoose documentation to figure out how to specify things like validation parameters. I strongly encourage you to take the time to read through all of the Mongoose documentation until you fully understand all of the properties that you can specify here. It’s very powerful, and will save you a ton of time down the road. You may notice that this follows the updated ES6 syntax, and will only work with more recent versions of node. Note here that we’ve specified the five routes that we decided we’d need way back in Step 1. Be careful here because although similar, the Mongoose query syntax is NOT the same as the MongoDB query syntax. You should definitely spend enough time reading the documentation to understand how the two systems are alike and different. With any luck, the comments in the code explain most of what is happening here. There are some elements that I found confusing, which I’ll explain now. “Middleware” is the stuff you find in app.use(...); statements. In some (most?) tutorials I looked at, the middleware was defined before the routes were defined. However, I learned that some middleware, e.g. jwt, CORS, and body-parser, have to come before the routes are defined, while other middleware, e.g. 404 handlers and error handlers, come after the routes are defined. I’ve divided these into “preflight” and “postflight” middleware sections in my code. I also learned that a 404 (File Not Found error) is not considered an “error” in Express. That’s why it has a separate middleware handler all of its own. That one kinda threw me off. The CORS middleware specified here should allow access to this API from any domain. This is probably NOT the best solution. In fact, I’m sure that it’s not. However, since I’m still in development mode, I made it as open as possible. After I get everything working the way that I would like, I will update it to follow best practices for CORS. 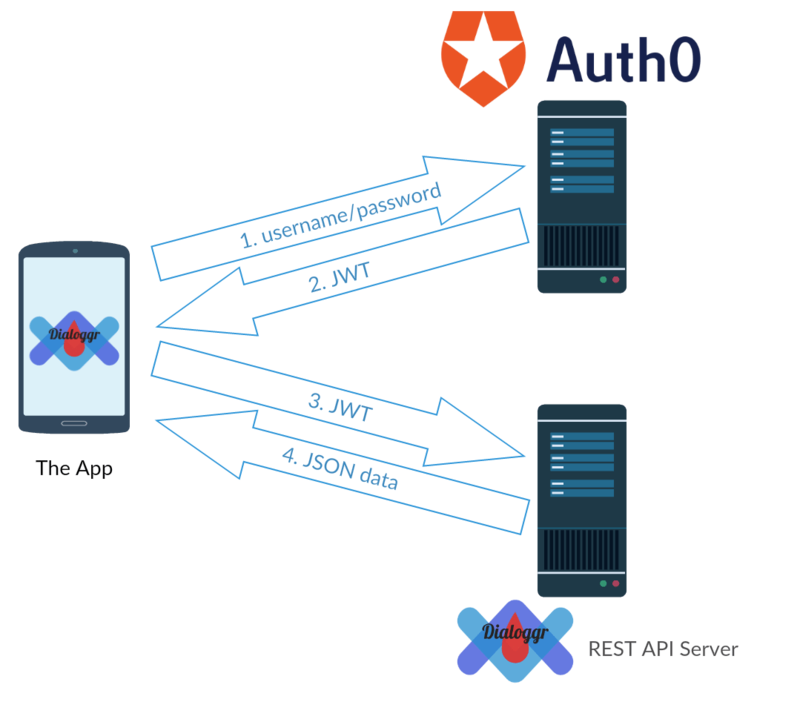 And if that long gobbledygook string after “Bearer ” is actually a valid JWT (that you got from Auth0 when you logged into your app), your REST API server will be able to securely authenticate the request. I don’t know about you, but I find that truly amazing. Finally, you may want to comment out the JWT stuff from server.js while you’re still working on developing your routes and your other middleware. You’ll of course uncomment it when your API is live, but it would be a pain to have to get a JWT manually so that you can test things. "message": "you have tried to access an API endpoint (/) that does not exist." That’s because our API does not define anything interesting at the default route (i.e. /). If you visit http://192.168.33.10:8080/entries, however, you should see something like , i.e. an empty set of square brackets to indicate that you got back an empty set of data entries. Of course! We haven’t added anything to the database yet!! // is this person logged in? // NOT logged in; maybe redirect to the login page? 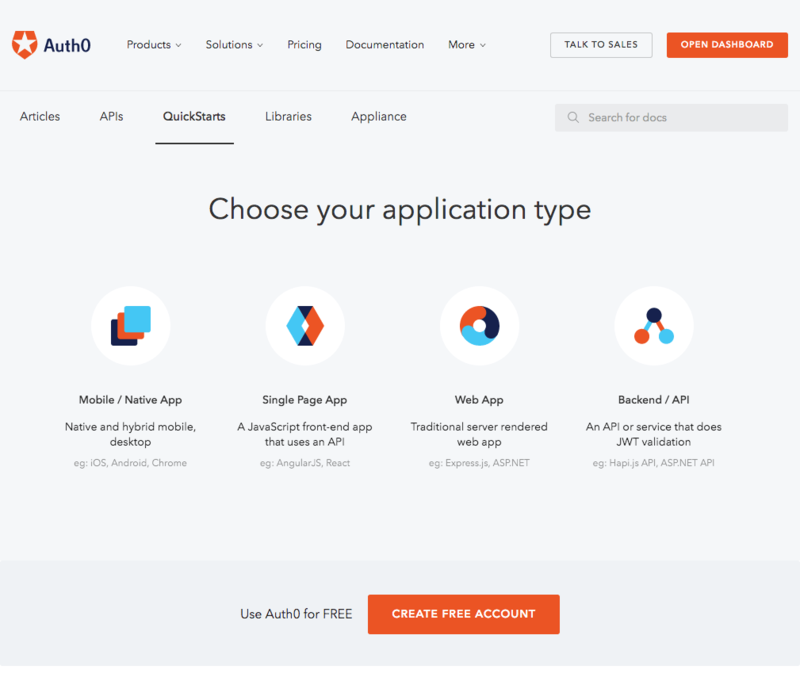 This creates an injectable API service in your app that you can use in your pages to get data from your REST API. In this example, I have not created a post() method that would allow you to update resources on the server, nor a delete() method that would let you remove resources from the server, but hopefully you’ll be able to figure those out. In your template file, then, you could loop through all of the entries that were returned by the API call and display them in some fashion. I’m going to show you how to do this at Digital Ocean, my favorite web host. Basically, you’ll want to follow this tutorial on how to set up a NodeJS app for production on Ubuntu 16.04. However, in addition, you’ll need to use the same procedure you did earlier to install MongoDB on the server. Also, instead of the hello.js server that they create in the tutorial, you’ll want to clone your REST API code from GitHub, or wherever it is you have it stored. You’ll have to manually recreate your .env file in the root directory of your server. This tutorial shows you how to use Nginx as a reverse proxy server, and PM2 as the process manager that keeps your API service up and running even if the machine has to reboot. It also shows you how to set up a free SSL cert using LetsEncrypt. Using SSL is super important for running a REST API in production. If you’ve made it this far, congratulations!!! This was kind of a marathon post, but it took a long time for me to figure all this stuff out, and I didn’t want to forget it. I also wanted a comprehensive reference for my students who are building REST API’s for their own Angular and Ionic apps.